This plug-in adds 16 custom fields and a new section for Lightroom's Metadata panel (see right). Two extra fields called event name and people were originally added for iViewMediaPro/ExpressionMedia users. The extra fields are shown in the Library Filter panel, and can be targeted by Smart Collections. 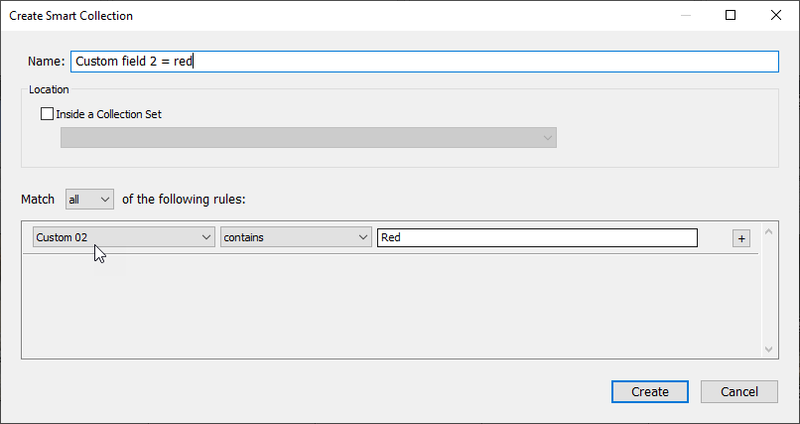 They are also accessible by Search Replace Transfer's main functions, so you can use Transfer to populate one of the fields by copying across from the copyright field - meaning you can then search for entries in that field. 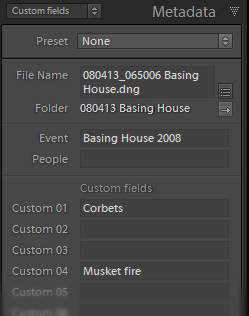 These custom fields are stored in the Lightroom catalogue and are never written to images themselves or to exported files. That is both good and bad. It means that they can be used for information which you do not want others to see, but it also means the information is locked inside Lightroom and only a plug-in can access the fields. So if you ever leave Lightroom, it's not easy to get to the data. I’ve deliberately not encrypted the plug-in file where this metadata is defined. Changing the field names - for "experts"
If you don’t like the custom fields to be named Custom 01 etc, there is a way to change the names. Just open PluginInitCustomFields.lua in a text editor such as Windows Notepad or TextWrangler. 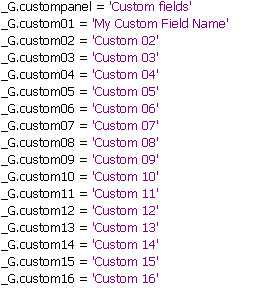 Here I have changed the name of Custom 01 to “My Custom Field Name”. For the changes to take effect, you’ll need to restart Lightroom, or reload the plug-in. However, remember that this PluginInitCustomFields.lua file will be overwritten by updates of the plug-in, so you should keep your copy of the file in a safe place.